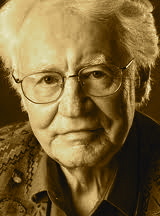 A Year of Being Here: Robert Bly: "Climbing into Bed"
"Climbing into Bed" by Robert Bly. Text as published in The Cortland Review (Winter, 2011). Hear Bly read his poem on the publisher's page.